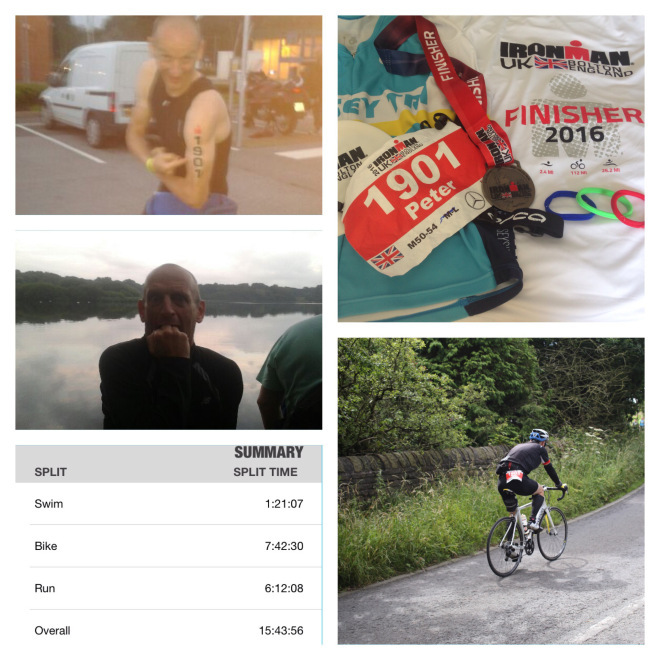 Read the full story 'from Couch to Ironman: In less than 4 years. So fast forward to the weekend of 15th, 16th 17th June 2016. On the Sunday morning timing wise that meant 3am start. Showered and pre race breakfast – smoked salmon with 3 rounds of thins for those curios – setting off around 4am to arrive in time to get the wetsuit on and check the bike out and to fill my feedbag. Arriving in the car park and putting the wetsuit on really kicked in the nerves. Seeing how calm the swim course was eased them off a very small fraction. Some more faffing was done then it was time to head to the starting pen. Thankfully it’s a rolling start and you seed yourself into appropriate times. I said all long I should be around the 1hr 20min mark for the swim so that’s where I headed to. I soon found it and stood in the mud and soon started to chat to the bloke next to me. My feet started to get cold standing in the mats proved but the mud was warmer. I was a bit envious of the fella that had a pair of plastic over shoes on. (The type you see on building sites or swimming pools). So after the anthem is played and me saying I hate that tune and the race starts we start to edge closer than closer. One big last sight of Neil a hand shake and a couple of fists it’s s was soon my turn to enter the water. My plan was fairly simple. Swim wide in an attempt to keep away from being knocked about and swim well within myself. 1st lap was fairly uneventful, I kept wide didn’t seem to get in the way of anyone and no one really got in my way. Well not until the around the last turn about 50metres from the exit. Where I got accidentally “punched”. Fella was breathing to the opposite side to me and his hand came over and caught me square on the jaw. Pure accident. I exited the water and had a quick look at my watch slightly ahead of my prediction. 38mins odd. OK same again I said to myself running along to enter the water again for the second lap just has the lead Pro passed me on his completion of his swim. Well I did give him about a 20 minutes start. Second lap started much has has the first. Wide and swimming (for me) fairly straight. Got to the first and second turns without incident. Then about 2-300 metres before the last turn before the exit it struck. Cramp this wasn’t just cramp this was CRAAAAAMP, both thighs and right calve where affected. Thankfully I managed to ease it off and get in. I’ll be honest it did shake me up a bit. Into transition 1 and I forgot to press the watch but I kinda knew I was around where I expected to be. The course is a 2 lap affair but to get to the start of those laps you’ve got around 25km to do. I hadn’t previously cycled this part of the course but knew it was generally up hill. My training indicated I would hit the first big climb – Sheephouse lane – just over the hour mark. A quick pitstop at the aid station before it meant I was right with my prediction. This was where hopefully my support crew would be to cheer me on. A quick look around at the start of the climb and no family or Neil. I said to myself probably delayed due to the diversions. One last quick glance around at the village green and I think I see the top of Neil’s head walking down. By all accounts it probably was. So fuelling was going well hydration was going well. Average speed was creeping back up after Sheephouse. Heart rate was well within zone. So everything going to plan. Then again it was back – cramp. Not has bad has in the swim but it defiantly was back. Getting through an event like Ironman is about making hundreds if not thousand of decisions. My decision was to eat. What I had accidentally found was if I ate and my jaws where moving the cramps seemed to ease off. So that’s what I did. I know I couldn’t continue eating all my fuel at the rate of the cramps where occurring. Thankfully I had put some additional supplies in my “special needs” bag which I was coming up to fairly soon. Then my stomach didn’t feel to good. Decision was stop at the aid station grab some stuff from my bag and plod on. For those of you that are interested my fuel was SIS protein bars, Nutella & honey wraps (quartered) and SIS gels. I had a mixer can of coke on me just in case with a couple in my special needs bag along with some haribo sweets. At the aid station I took a swig of coke hoping that would settle my stomach grabbed what I needed and headed off again. Pace was still within the range I predicated. After the aid station at Buckshaw village the course is flat until Croston where it is a steady climb to Hunters Hill. The second big climb and for me the tougher of the two. Two reason for this I think is. Your climbing up from Croston until you get on to it and it’s a short(ish) sharp incline to the top. Having spotted Dave from the Tri club at salt pit lane and having another toilet stop at the next aid station I found myself on Hunters. I predicted I would be on Hunters around 11am and I was bang on. A good mate was on the climb taking photos and giving moral support along with his Mrs. Very much appreciated Matthew Nelson, especially on the second lap. The climb up over hunters was soon over and done with. The 2nd lap commenced and continued along much has the first. With up over Sheephouse this time seeing the support crew. Keeping a fairly steady pace with cramps still coming along to bite me. So much so the decision was made to take the steady climb out of Croston to the aid station easy. Quick pit stop and a gel and it was Hunters again. It was tough. On my 105miles 2 loops teaming run a number of weeks before I did Hunters 3 times, just to make sure. Has I turned onto it at the bottom a grabbed a handful of haribo and started chewing. It doesn’t kick up until a couple of hundred yards or so from that point but I thought start the chewing early. Onto it proper and the crowd giving its full support my inner voice was saying “you will not cramp up you’ll will not put you foot down”. Seeing someone walking up helped me I started saying “you’ll not be that man”. Matthew and his wife Gill was at the right point to boost me until the top. A big thanks to him and his wife for the support and photos. Soon I was up and over and making my way over to the end of the 2nd lap. My feed strategy from just after Hunters until T2 was gels & fluids only. Nothing solids. Basically it worked. This strategy was gained from a question I put into cup of Tri podcast due to my gut problems in Colwyn Bay last year. Thanks for the advice Rob not only on the podcast but on the webinars you’ve also done, especially 9:1 run strategy. Also a big fist pump of joy to Helen from the show, what a performance on Sunday. If you’ve not listened download it and start listening. Like most things you’ll listen, learn and adapt things for your own needs. 2nd lap ended without much else happening and then headed towards the reebok for T2. Heading into the T2 family and Neil where heard and seen. Then Into T2 and racked the bike. Quickly into the tent to change. Some stats on the bike average speed was what roughly what I expected between 23-24km/hr, with it being 23.3 on the day. Second loop was about 20 mins slower than the 1st mainly due to me nursing the cramps better I think. I hadn’t previously been on the run course. Only things I knew about it was you went out the way you came on the bike which meant up a steep climb and for most of the rest of the course once over about 5 miles you where either going up or down. My run strategy was fairly simple run 9 mins walk 1 minute. I had no idea what time was achievable, but thought 5hrs 30 to 6hrs. An ironman marathon isn’t like a normal marathon. Training wise I did 20miles in 3hrs 30mins but I know I would be slower than that. Run started after passing the family and Neil again. Big high fives over towards them and a possible thumbs up showing all was ok. Looked at my pace and it was to quick, heart rate was also showing that. Walk up the first big incline in an attempt to get that back down. It helped. Coming out of town a fear come over me, I realised I hadn’t picked up a band yet. Phew you pick them up further up. The bands for those of you are wondering what’s he on about now. They show what lap your on. They give out a coloured band after each lap. Picking up the first was a good feeling the second was better but nothing beats picking up the 3rd and final band. The rest of run until picking up the 3rd band was fairly uneventful. Didn’t feel great but didn’t feel too bad either, all things considered. Seeing other Mersey Tri vests on the course helped, with high fives exchanged with a few on their way to becoming an Ironman. Hopefully I’ll meet some of you soon to exchange stories about the joint experience. Some cracking results from Mersey Tri folks on the day. Well done to all who took took part. Sorry to hear one member was out after hitting his knee(?) on a hidden rock on the swim. That really was a sore one. Final turn was reached and the expected boost came and stayed. This resulted me in “running” most of the way to the finish. Quick stop with the support crew to thank them all and I am not ashamed to say it appeared I had something in my eye. So to the finishing shoot. Some walk it, some milk it and high five everyone on the way down it. Me I was planning some Ronny roars. Which I did but it felt crap so I stopped, I didn’t milk it and I just wanted it over so by all accounts I took 18 seconds from the final timing mat to the finishing line. 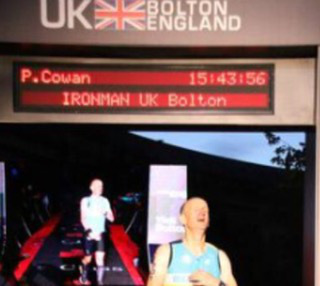 Over the line a quick look up and relief – Peter Cowan you are an Ironman. Quick photo with some photographer putting me into place and off to meet the support crew. kisses, hugs and thanks exchanged through a metal fence. Well that’s if thanks for reading if you’ve made it this far. Small satchels of chamois cream were a god send.